There’s no doubt about the fact that I’m a sunshine girl. But life’s crazy hurricanes and tornadoes have taught me that brilliant rays of hope and light come from within- not without. A few years ago, this lesson was made a bit more real to me when on a particularly dreary winter day, a package arrived at our family’s doorstep. All of us were curious as to what it might be since no orders had been placed and no one had a birthday coming. I hadn’t really heard of one before either, but trust me, this box was golden. All sorts of little treats and trinkets were contained within its four walls and most of them were bright sunny yellow in color. Yellow nail polish for the girlies…yellow packages of candy… a yellow gift card to an ice cream shop…glitter glue, crayons, and coloring books…yellow gum…a yellow bottle of bubbles.. I’m guessing you get the idea. Honestly, I cried as I read the bright yellow note. Because I miss my dear friend and her thoughts of our family were vividly evident in each of her gift selections. She even sent us a new recipe for lemon pudding cookies. And it wasn’t so much about the “things” themselves but my tears came from her time and detailed thoughts of encouragement for our family. 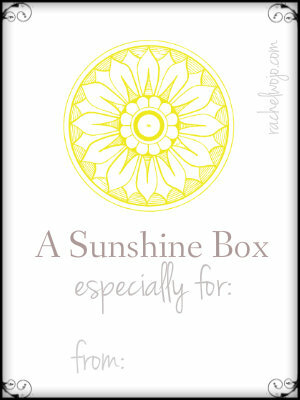 So today I’m encouraging you to pause for a few minutes and put together your own “sunshine box” of encouragement to give to someone else. And I plan to pay it forward myself. 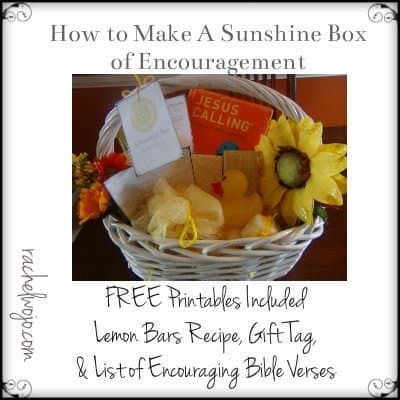 Click HERE or on the sample tag graphic above to open a .pdf with coordinating tags to use in creating a sunshine box of encouragement for someone who needs to know the love of Jesus! Post contains affiliate links; this site may be compensated if purchase is made. See full disclosure policy here. 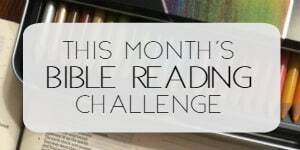 This year, my word is “encouraging” and this is a perfect idea to help in my quest to encourage others! The yellow idea is a great idea, who can look at a daisy and not smile? Excellent idea! Thank you so much for sharing! 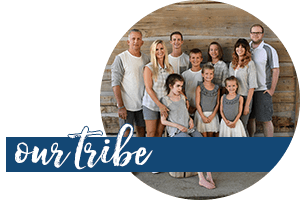 I find your blog such a blessing – all the printouts, all the unique ideas…. thank you Lord! Grace-filled idea! Thanks. I will do this project with my grandchildren. Here’s another variation: I’ve had lots of hospital time as caregiver over the past couple of years. A very big hit with my dad was when the church brought a sack of one-a-day treats. Each was wrapped up, so he couldn’t see what was in store for the next day. He looked forward to each morning to see what was next. It was a ray of light in a dark time. One of my favorites was a votive candle holder with a battery powered tea light. Other items might include a candy bar, trail mix, a Sudoku book, an encouragement magnet, a pen, a magazine. 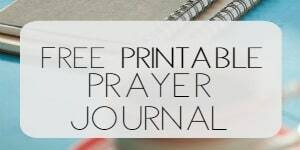 Adopting and adapting, I will now include slips of paper with encouragement verses in each little package and a “ch@t” prayer pattern bookmark. The caregiver is also in need of encouragement and acknowledgement of doing God’s work. A hug and whispered, “God blesses caregivers” is a powerful message. Thank you so much for sharing those ideas! Love them!